Vote for Goal of the Month here. Follow Man Utd v Everton here. "And they woke up and it was all a dream." This fairytale doesn't seem like it is going to end that way somehow. Claudio Ranieri is warming up his trophy-lifting biceps and the Foxes are still trampling everything before them. "50p to watch your chopper mate"
When you own the club, I guess you can use the pitch as your own personal parking spot. Leicester City owner Vichai Srivaddhanaprabha has just choppered off home after seeing his side win. This day a year ago this was why Leicester fans were staring at the league table. Since then Leicester have played 41 Premier League games - winning 27, drawing 10 and losing four. "I don't want to think about champions"
Leicester manager Claudio Ranieri on BBC Sport: "They had a fantastic chance in the first half, but we worked so hard. It was a normal run by Danny Simpson with the arms close to the body. If the ball does not hit his arm it hits his body. "Everyone is expecting something more for us and we are in the cloud, but we have to keep concentrating. "We want to stay there and continue. If the others are better than us then congratulations. We know it will be hard - in the next match Sunderland will be fighting to survive. "I don't want to think about champions. I want to focus on the match. There is a chance for us to be champions this season, but we have to be professional." Leicester manager Claudio Ranieri on Sky Sports: "Clean sheet, three points, step by step. It's fantastic because we know very well Southampton came here with a lot of confidence. "They had a fantastic chance but Simpson made a fantastic save. It was very close to him, he was running and his arm was very close to his body. "I said to the players, it's the chairman's birthday, he needs a special present from us. The skipper came back from a long journey with the national team, it's amazing. "I enjoy it a lot when we maintain clean sheets. We are dreaming, if we fight we can do something and we must continue. It's important to stay very calm and maintain our feet on the ground." "If it is a penalty and a red card, they don't win"
Southampton manager Ronald Koeman: "We started the game badly and lost control, but after 20 minutes we were dominating. But for the third match in a row we don't get a 100% penalty - Stoke City away, Liverpool at home, and today two penalties. The big one is when Sadio mane's shot hits Danny Simpson and it is a red card and a penalty. "If it is not a handball, it is a goal. I don't know what they are doing. This is a big match. It is about the Premier League title and our ambitions to play in Europe. "The second one was when Robert Huth handled. "I don't say they don't deserve the victory, that they don't fight and have amazing spirit, but if it is a penalty and a red card they don't win. "I don't think that they are against Southampton, but it is very strange." Leicester captain Wes Morgan: "We saw the [Tottenham] game yesterday was a draw and wanted to make the most of our opportunity. We really wanted it today. I've been getting a lot of stick because I haven't scored all season so it's great to shut them up. I was quite ill yesterday but obviously I wanted to play." Sunderland away, West Ham home, Swansea at home, Manchester United away, Everton home, Chelsea away. I reckon that - with a lot more love for Claudio Ranieri at Stamford Bridge than there is for Tottenham or Arsenal - three of those are as good as bankers. Leicester need four wins from their final six games and the Premier League title is their's regardless of what anyone else does behind them. Blues shirts converge in sweat-drenched hugs. The Leicester fans are on their feet in the stands. "We're going to win the league" echoes around. I think we had better believe them. 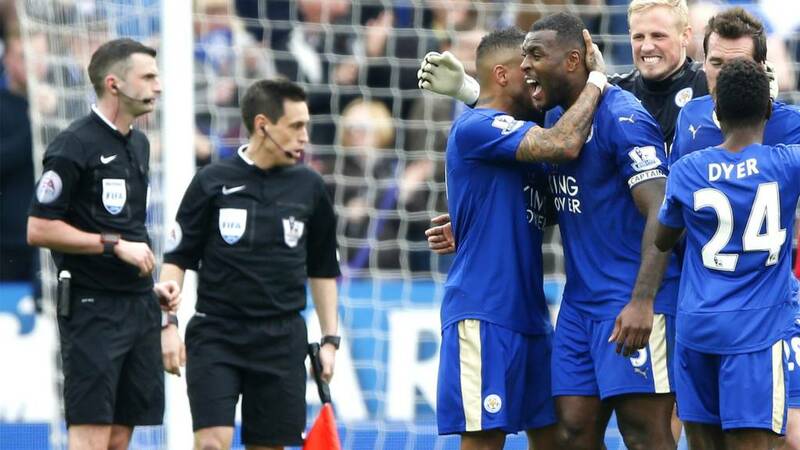 Wes Morgan boots the ball high into the sky and the final whistle blows. A late Saints free-kick as N'Golo Kante blunders into the back of Charlie Austin near the Leicester corner flag. The King Power Stadium gulps. Leonardo Ulloa plays the ball off Sadio Mane and out for a Leicester goal-kick. The Foxes are almost home and hosed. Jamie Vardy is having a party. The Leicester striker demonstrates to Michael Oliver that he thinks Charlie Austin has made a meal of a tackle by launching himself into a full-length dive. Grins aplenty but the job is not quite done yet. "We shall not be moved" sing the Leicester fans defiantly. Demarai Gray has done his job excellently since coming on. He wins another free-kick up near the Southampton corner flag as he lures Cedric Soares into a rash tackle. We have five - FIVE - minutes of injury-time. I'm not sure where they have come from and there are groans around the King Power. Marc Albrighton comes off and Nathan Dyer comes on. We are in the last minute of normal time.